Last week, I was lucky enough to be invited to the headquarters of CHAM Korean Bistro (Pasadena) and iT! Jeans for a kimchi pickling workshop. We were treated to CHAM cocktails made with sparkling wine, yuzu, Korean Makgeolli as well as tofu rice pockets filled with everything from kimchi (and candied anchovies) to seaweed salad, pepper-encrusted ahi tuna and salted and roasted kale chips. It was a dinner filled with Korean fusion delight. 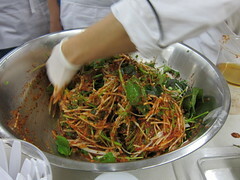 For the learning portion, we got a demonstration on how CHAM makes their kimchi, with recipes and instructionÂ straight from Chef EJ Jeong (formerly of A.O.C. and BOA). Check Cathy of Gastronomyblog‘sÂ great write-up of the Napa Cabbage kimchi we were all taught to make. 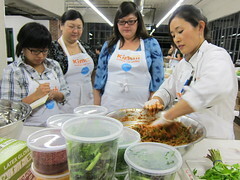 After our appetizers, kimchi lesson and deliciousÂ main course (pork shoulder, cabbage kimchi, salted shrimp and sesame leaves) – we got a taste of a different kind of kimchi, which ended up being my favorite of the night: Persimmon kimchi! The recipe for this is actually the same as the traditional cabbage kimchi, save for the elimination of salted shrimp. It became intuitive that fishy, saltyÂ persimmons are not appetizing. But the subtle and firm sweetness of the persimmon is paired so perfectly with the chili flavoring I’ve learned to love in Korean kimchi. 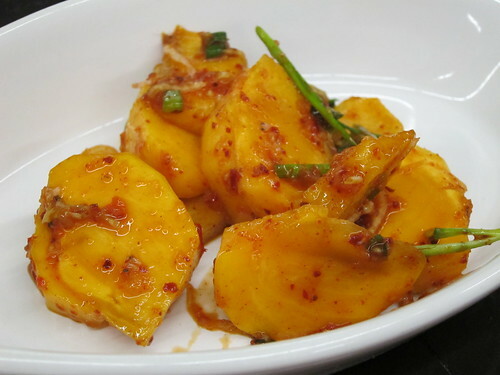 It was like a live, Korean version of the Trader Joe’s dried chili red mangos that are so popular. An interesting tip with this recipe is to use unripe persimmons, because they will actually ripen as they are fermenting in their container and in your refrigerator! Mix puried water with sweet rice powder, dissolving the power until there are no lumps. Heat the water and rice powder mixture over the stovetop, stirring occasionally to prevent it from sticking to the bottom of the pot. When it starts to form bubbles, reduce heat and stir continuously. Once the mixture becomes thicker and is translucent, turn the heat off. The process from once the mixture is heated to when it becomes the correct consistency and color takes approximately ten minutes. Cool down completely. I’m no hotshot in the kitchen, but I plan on giving persimmon kimchi a try. And if you feel so inclined to get your own kimchi education, CHAM is luckily going to be hosting another workshop on Saturday. You’ll get to take home your own jar of cabbage kimchi so you can leave it in your refrigerator to ferment for at least 20 days before eating. It’s the workshop that keeps on giving! $40 per person – includes Korean tapas, a cocktail, and kimchi to take home. Ohhh, I love pickles. 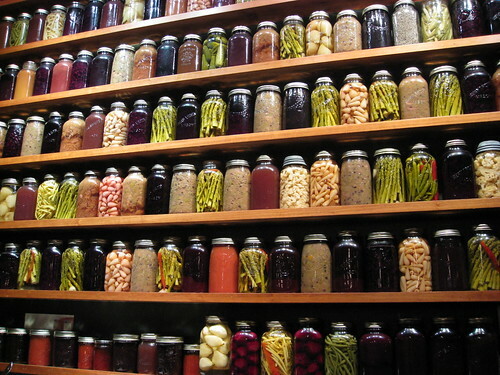 I may even love certain vegetables more after being pickled, depending on my cheek puckering mood. Kraut, beets, peppers, onions, radishes – give ’em all to me. It’s one of the preparations that so many ethnicities share while differing in the processes themselves. Fortunately, it all doesn’t have to be completely lost on us. Chicks with Knives will be hosting a “Pop-Up Pickle Shop” at the one and only Starry Kitchen in Downtown LA this upcoming Sunday, September 12th in the late morning. It’ll cost you just $5 for entry, which includes a cooking demo at 11 AM by the gals themselves, and you’ll get the opportunity to apply what you’ve learned. Pickling mix ($2) and pickling kits ($20) will be available for purchase. And if learning to better consume pickles is what it’s about (I’m raising my hand here), there are also a variety of pickles for sale ($6-8). Since there are limited quantities, I recommend getting there early. Just remember: These pickles are indeed “perishable” because these veggies aren’t hot-processed nor canned and should be consumed within 2 weeks. Guess the canning workshop will have to wait.